I often find myself answering the question, why didn’t anybody adopt a revolving rifle based on the M1895 gas-seal Nagant revolver? It does seem like a natural solution to the gas-related problems inherent to a revolving rifle, doesn’t it? Well, the answer is that at least one group did adopt just such a weapon: the Mexican Rurales (Rural Police). In the late 1890s, they bought a number of 9-shot gas-seal revolving carbines from Pieper of Belgium. The guns were chambered in 8mm Pieper, a cartridge a bit longer than 7.62mm Nagant, but with the same feature of the brass extending beyond the end of the bullet. 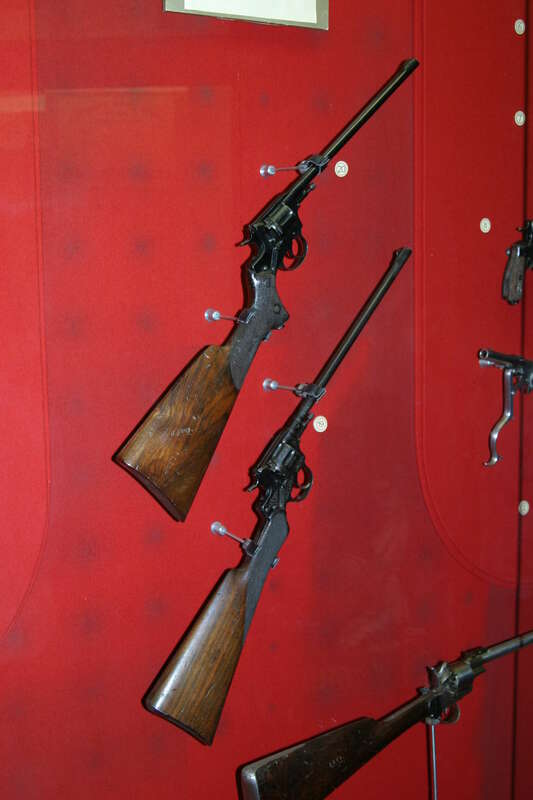 These carbines functioned the same way as the very common 1895 revolvers, with the cylinder camming forward upon firing and the brass case forming a seal between cylinder and barrel. I happened to find one of these carbines at the Antique Arms show in Las Vegas last weekend, and took a few photos (I apologize for the poor lighting and horrific carpet background; it was all I could find at the time). Unfortunately, this particular one has some parts either missing or broken, as the cocking and cylinder camming action were not functioning properly. However, I was able to actually handle one of these for the first time, and came away impressed by it. The weapon as a whole is light and well balanced – it comes to the shoulder well. The cylinder opens smoothly and easily as well. As a weapon for a mounted policeman, I think it has a lot going for it. Firing one-handed would certainly be much easier than with a lever-action (the Rurales standard weapon at this time was the 1894 Winchester), with no second hand necessary to ready the carbine for a followup shot. Ultimately, I expect it was the proprietary ammunition that led to these revolving carbines being abandoned for Winchesters, and it’s hard to fault that choice for men who might easily need to acquire ammunition far from government depots. Hopefully one of these days I will find one of these in good working order to actually try shooting! The Pieper gas seal eliminates the usual objection to revolving rifles, ie gas escape to the sides and potential for injury. I still maintain the Pieper system provides a simpler, better cylinder indexing system than the usual latch and forcing cone… but back when pistol cartridges used black powder, the benefits of having the powder residue contained to the barrel and cylinder would have made cleaning much easier. Assuming the cartridges were basically “pistol” cartridges, I expect their power level when compared to any chambering of the 1894 Winchester was also something to be considered. The Border Guard of Russian Empire also adopt gas-seal revolver-carbine. You can see photo here: http://weaponland.ru/load/revolver_nagan_obr_1895_goda/120-1-0-650 (it is described: Револьвер-карабин для пограничной стражи, изготовленный на базе револьвера Наган обр 1895 г which mean Revolver-carabine for Border Guard, based on Nagant 1895). It was produced by TOZ (Tula Plant) in 1912 – 1913 years. But it was considered failure: the Border Guard was horse formation, so the method of cartridge loading (one-by-one) was drawback, also the cartridge was considered as a too weak for carbine. Length of barrel of this weapon is 300mm, overall length 700mm, stock is fixed. According to the article “Collecting on a National Theme” by James B. Hughes Jr. in the Gun Collector’s Digest, Vol. 1 (Digest Books, 1974), the mounted Guardia Civil also were issued the Pieper carbine, along with a Pieper-Nagant revolver using the same ammunition. They were first issued around 1893, and apparently remained in use until the early 1920s. As stated above, the gas-seal system does seem to eliminate the main objection to a revolving long arm. But the ballistics of the 8 x 37Rmm Pieper cartridge (roughly those of the 7.62 x 38R Nagant in the Russian M1895)aren’t really up to those of the Winchester .44-40s they replaced. I’m forced to conclude that in the upheavals that Mexico faced in the ensuing quarter-century, the troops equipped with the Pieper carbine and handgun probably wished they’d kept their Winchesters, Colts, Merwin-Hulberts, etc. Увы, я пишу только на русском языке. Еще можно перейти по ссылке и если не откроется нажать F5 (обновить страницу). Try to copy the address of a buffer memory, and then paste it into your browser (Ctrl+C, Ctrl+V). You can still click on the link and if not open, press F5 (refresh page). Apparently the best minds of Mexico had to always go somewhere else to produce anything. Mondragon and Obregon designs were ahead of their time. If Mondragon’s automatic rifle had been a bit less sensitive to “climate conditions” (a problem it shared with most of the other auto rifle designs of its era), it might have put the auto rifle on the map a decade ahead of the BAR. Obregon’s rotating barrel lock is still with us, notably in some of Beretta’s designs. Mexico’s arms designers have often been under-rated by everyone else. I suppose accessing them would require registering on the forum. Many forums restrict locally hosted images to members only. That’s a cool gun and a great design.I bet it fetches considerably more than the surplus revolvers,but even those are bringing descent money now compared to when they first came in to the country.It looks like an 18”-20” barrel,that should get that 8mm round up to 2000 fps or better.I see that Taurus makes revolving carbines now and they have kind of a shield over the cylinder gap but it doesn’t look nearly as effective as the Pieper. I think an excellent modern gas-seal revolving long arm could be made, and we have a ready-made cartridge case for it. Use the .357 Maximum case with an inside-reamed neck to allow the bullet to be seated deeply enough to duplicate the Nagant 7.62 x 38R arrangement. Yes, it would have to be restricted to standard .357 Magnum loads, to avoid excessive pressure, but considering what those loads do velocity-wise in a 16 to- 20 inch barreled lever action, that should be more than enough for most purposes. Best of all, you could also use it in a specially-chambered lever action, and solve the old problem of bullets being battered and pushed back in the case in tube magazines. I would point that also the straight-walled rifle rimmed cartridges can be used for that purpose. For example the .38-55 Winchester – additional benefit is that it is easier to shorten too long case that elongate too short case. One problem with black powder era cartridges in this context is that while all of them have solid-head cases today, even the ones that started out as balloon-head types, the web thickness isn’t always up to that of cases that date from the smokeless-powder era. The .38-55 is an exception. It has a good thick head and web. When the .375 Winchester was developed from it, they thinned both, and I really don’t know why. Another good choice would be the .307 Winchester case, which is basically a rimmed .308 Winchester. Or to put it another way, a rimmed .300 Savage. If the objective is a maximum-power revolving rifle, an even better choice would be to start with one of the belted Magnum rifle cases. The .300 H&H case would be a good choice, as you could have a full-length straight-walled case longer than the .458 Winchester. I could also see a system based on the .444 Marlin or .225 Winchester. Both are rimmed cases with ample strength at the head, as shown by the fact that J.D. Jones used them as the basis for most of the JDJ wildcat cartridge family. “Emphatic” is an understatement when describing the JDJ rounds. Thank you, Ian , for another interesting article. Thanks also to Dimitry and Leszek for all the great work on the Nagent Carb. Ihave never seen any info on this before! Anywhere! Some time ago Leszek wrote about posting some of the lesser known 2nd line weapons issuded to German forces and caputuers during the 1944 Warsaw rising. I do hope the bears fruit soon. Though Nagant gas check concept borrowed completely from Pieper, the mechanism of two revolvers is quite different. Forwarding the Pieper cylinder is shorter than Nagant and even not noticeable. Forcing the cylnder is made by an integral lug cut out at left side of hammer axis against to a lever pinned through the rear sight and penduled down. The “V” shaped mainspring forces both trigger via the rotating hand, and hammer as taking it rearward by a shoulder cut at trigger relating arm when trigger is released through a way very similar with old type Colt revolver actions. Double action sear on the hammer is not movable and trigger return is provided by the movable double action sear pinned at rear of it. When the trigger is pulled over a loaded cylinder chamber, the hammer rotates and runs forward to the formost position as forcing the forwarding lever against to the case back and by means, forwarding the cylinder to the engagement with barrel and supporting the lever via the integral lug at instant of firing. Releasing the trigger also takes the hammer considerably to the rear and the support position of forwarding lever and, if case mouth is sticked into the barrel back, a small lug at fore top of trigger forces the cylinder back pushing against to a annular ring cut at rear of cylinder surface in front of the indexing grooves. Second result in list. Page don’t exist right now, dunno why. But there was hires photos of that carbine. Direct link to gallery. Enjoy! I definitely hope you get a chance to do a video shooting one of these. Though I suppose ammo for it would be a bit hard to come by these days. Thanks to Battlefield 1, it’s getting better known. Very curiously, one specimen of this gun has turned up in China between 1900-1949, now it’s preserved in the Beijing Police Museum.